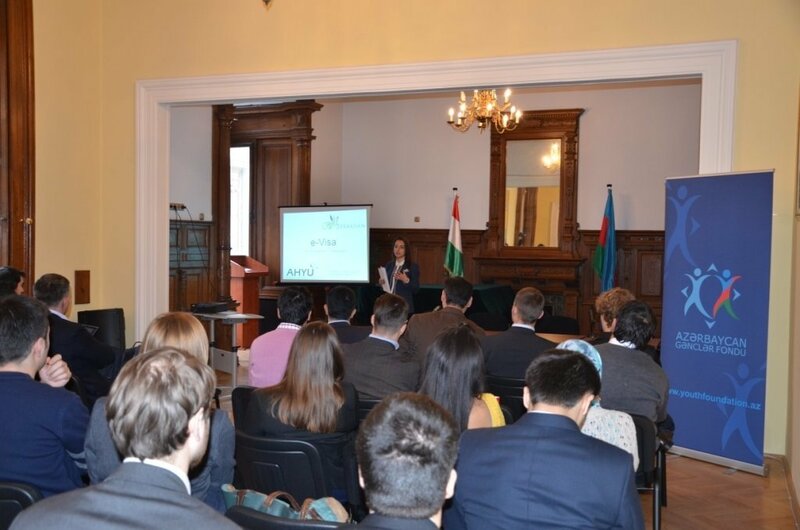 Press release – Azerbaijani-Hungarian Youth Union (AHYU) organized this event by financial support of Azerbaijan Youth Foundation and organizational support of the Embassy of the Republic of Azerbaijan in Hungary in November 21-22 in Budapest, Hungary. Selected participants from Azerbaijan and Europe, as well as representatives of embassy, Hungarian National Assembly (Parliament), Azerbaijan Youth Foundation, NGO activists participated in this event. Ibrahim Safarli, Chairman of AHYU opened the first day of the event in the Office of the National Assembly, welcomed all guests and participants, informed about the history of this union and its past projects and explained the aim of this event. Then Vilayat Guliyev, Ambassador of the Republic of Azerbaijan in Hungary congratulated AHYU Board Members for realizing this project successfully and emphasized the importance of improving existing relationship between Azerbaijani and Hungarian youth. He mentioned that the recent official visit of Ilham Aliyev, President of Azerbaijan to Hungary, Azerbaijan-Hungary Business Forum held in Budapest and signing of bilateral agreements including strategical partnership show deep relationship between two countries. After that Márton Gyöngyösi, Member of the National Assembly of Hungary and Chairman of the Hungarian-Azerbaijani Friendship Group of the Inter-parliamentary expressed his satisfaction regarding fast development of bilateral relationship between two countries in recent years and emphasized the contribution of similar events to the cooperation between Azerbaijan and Hungary. Orkhan Arabov, Head of Strategic Planning and International Relations Sector of Youth Foundation under the President of Republic of Azerbaijan also made a welcome speech and informed the participants about the activities of this foundation and past projects supported by this organization. The second part of the first day followed by the presentations from representatives of different organizations such as Hungarian Tourism Ltd, Ministry of Culture and Tourism of Azerbaijan Republic, Baku European Games Operation Committee, Balance Law & Tax Firm and Rixos Hotels. Presentations had informative and interactive character, informed about visa, immigrational laws and juridical aspects of tourism, main tourism fields and hotels of Azerbaijan. The second day of the event was held in the Embassy of the Republic of Azerbaijan in Hungary. Participants got information about embassy building and visa application process at the consular section. Then presentation explaning e-visa application process followed. The second presentation was done by polish participant who shared his memorable impressions regarding his visit to Azerbaijan. Some of the participants were awarded in the end of the event. The press release said, we would like to recall that AHYU was established by active Azerbaijani and Hungarian youth in December, 2012.